Its taper time! I finished my last test workout this morning in the pool and I feel exhausted but now its time to take a break before the race this weekend! What does taper mean, you say? 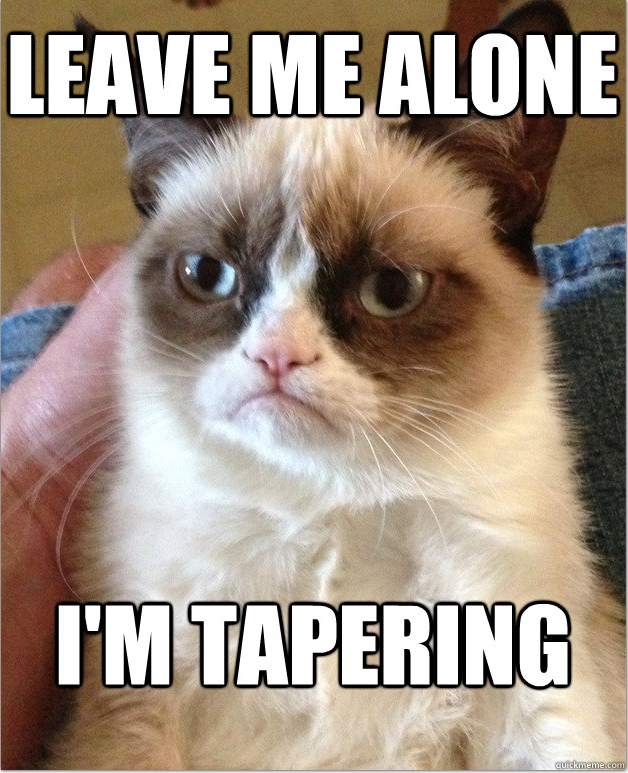 Tapering is something I became familiar with while swimming in college. When an athlete tapers for a serious competition it means they are taking a lot of the strain out of their regiment. For instance if you have trained six-days a week for 3 months, then when you taper you take it down to three-days a week. Also, depending on what you are training for, you take down the intensity of each workout. For instance if you are training for a short sprint race, then your taper time is filled with short sprints with long rest in between. If you train for a long race then you fill your workouts with longer at a high intensity with even more rest in between. The emphasis of taper is....you got it......rest. Since I have only been seriously training for a little over a month, my taper time is only 4 days. Since the Ironman is composed of swimming, biking, and running. That has been the bulk of my training. This last week I tested myself on all of those exercises, except biking. Biking has always been my main sore point for this competition. That is the only exercise that I have not actually done the distance all at once yet, and probably will not. It is because I do not own a bike, but mostly because I do not want to do it. Biking for me is not fulfilling. Nearly every time I swim, I swim more than 1.2 miles, so that is not a struggle area for me. Most times I run I run 5-6 miles but just yesterday I did a 10-mile run without much strain. The only tough part about it was the pressure I was beginning to feel on my knees. But since I run on a mountain trail here, and the Ironman is on a flat surface, my knees will be safe. Like I said, the only real experience I have not had is with the biking element. Yeah sure, I went to cycling classes but those probably do not prepare you for road cycling. That is where most of my nerves exist. The other two areas I know I have complete without much fuse, but cycling will be where I spend most of my time (almost four hours), but that is something I cannot worry about anymore. Taper is on and I will finish this race whether I like it or not. I will send post pics when I am done.